Ujjain, now in Madhya Pradesh is an ancient city on the eastern bank of the Kshipra River, Ujjain was the most prominent city on the Malwa plateau of central India for much of its history. It was the capital of the ancient Avanti kingdom, and is now one of the cities selected to be developed as a smart city under PM Narendra Modi's flagship Smart Cities Mission. Of the many kings who ruled from here is - Vikramaditya, characterised as the ideal king, known for his generosity, courage, and patronage of scholars. The name of the king means "the Sun of Valour" (vikrama means "valour" and aditya means "sun"). INS Kadamba is an Indian Navy base located near Karwar in Karnataka. INS Vikramaditya, is a modified Kiev-class aircraft carrier which entered into service with the Indian Navy in 2013. Named in honour of Vikramaditya, the legendary emperor of Ujjain is in news for wrong reasons. The Kiev-class aircraft carriers were the first class of fixed-wing aircraft carriers built in the Soviet Union. Unlike American or British carriers, the Kiev class is a combination of a cruiser and a carrier. Originally built as Baku and commissioned in 1987, the carrier served with the Soviet and later with the Russian Navies (as Admiral Gorshkov) before being decommissioned in 1996. The carrier was purchased by India in 2004 after years of negotiations at a final price of $2.35 billion. She was commissioned in Nov 2013 at a ceremony held at Severodvinsk, Russia. On 14 June 2014, Prime Minister of India Shri Narendra Modi formally inducted INS Vikramaditya into the Indian Navy and dedicated it to the nation. The upgrade involved stripping all the weaponry and missile launcher tubes from the ship's foredeck to make way for a "short take-off but arrested recovery" (STOBAR) configuration, converting the Gorshkov from a hybrid carrier/cruiser to a pure carrier. There were troubles at high seas. There were delays compounding the cost overruns, requiring high-level diplomatic exchanges to get these issues resolved. India finally agreed to pay an additional US$1.2 billion for the project, more than doubling the original cost. All reconfiguration work was completed at Severodvinsk, Russia. 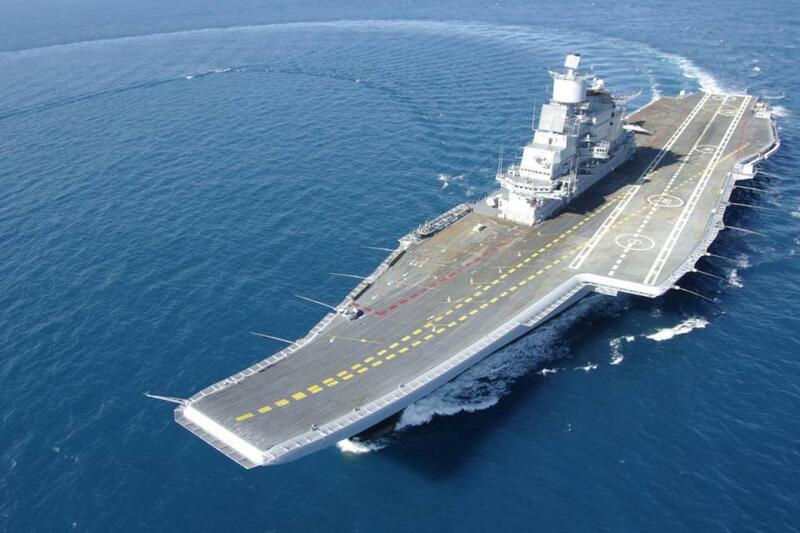 Indian Navy personnel began training on Vikramaditya in April 2011. Now it is reported that at least two people, including a civilian, were killed and another two injured following leakage of toxic fumes from the sewage plant on board Russian-made aircraft carrier INS Vikramaditya, which was undergoing repairs at Karwar in Karnataka. The incident of gas leakage took place at about 5:00 PM while the ship was undergoing maintenance repairs. Maintenance work was being undertaken in the Sewage Treatment Plant (STP) compartment. Due to inhalation of the toxic fumes, four personnel (two naval sailors and two civilian workers) were evacuated to Naval Hospital at Karwar, a statement by the Navy said. Two personnel, namely Rakesh Kumar Shipwright Artificer Class 4, and Mohandas Kolambkar, an employee of Royal Marine, succumbed due to gas inhalation, it said. The next of kin of the deceased have been informed. The condition of the other two personnel is stable, the statement said. The Navy has ordered an inquiry into the incident and action has been taken to render the compartment and area on the ship safe.